One of the most promising potentials to strengthen Payette’s downtown is to revitalize the block bounded by 7th Street and 1st Avenue North, 8th Street and Center Avenue. This block is encircled with buildings facing the street, leaving the interior of the block open forming a courtyard. The half-block facing 8th Street possesses an attractive row of one and two-story brick buildings in the heart of the downtown’s commercial center. Those buildings facing 7th Street have limited access and are difficult to reach because they face the highway overpass. Consequently, the buildings on the west half of the block are underutilized or vacant. Almost all of the buildings on the block were built near the turn of the century and contain nearly 70,000 square feet of commercial and second floor residential space. To overcome the negative influence of the overpass on this block and take full advantage of the block’s design and historical character it is recommended that the block’s building facades be rehabilitated and the internal space turned into a landscaped courtyard. 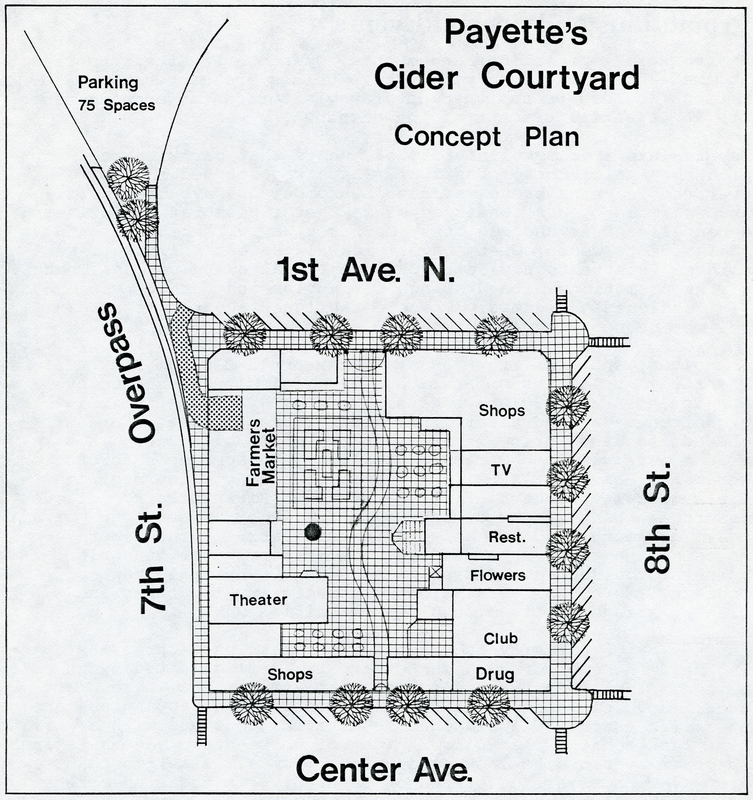 As illustrated in Figure 35 the proposed Cider Courtyard would feature a farmer’s market, outdoor dining, stage area, historic artifacts, flower garden, fountain, areas for relaxation, and attractive landscaping and lighting. The courtyard and its surrounding historic buildings would make the block a special place, attracting residents and visitors alike. Such a block with rehabilitated buildings, a variety of businesses and attractive courtyard would be unique to this region and would generate patronage not only for this block but to all of Payette. The courtyard, for example, would periodically feature events and activities, and artifacts such as the vinegar vats from the vinegar factory would create interest. Perhaps a cider tasting room would even be available. 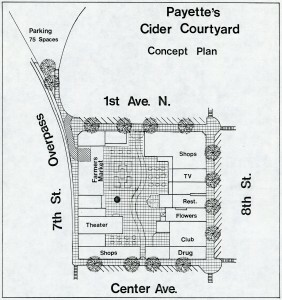 The Cider Courtyard would be developed through a coordinated effort of the block’s property owners and merchants, along with the assistance of the city. Individual property owners would work to upgrade interior retail, office or residential spaces and enhance their building’s front and rear facades. Working together as a group the property owners would develop the interior Cider Courtyard. Potential assistance to upgrade the courtyard and streetscape may be available through state and federal economic development grants. Prerequisites in making the plan successful include developing a strong Owner / Tenant Block Committee; granting mutually beneficial public easements to enable public access and joint use of the block’s interior; and eventually renovating the buildings. The overall scheme will be implemented at a pace permitted by the initiatives and financial resources of the property owners. Implementation of the courtyard would occur in prudent, logical stages timed in concert to the renovation of individual buildings.